If you (or someone you know) is an avid outdoorsman, we have the signs for you! 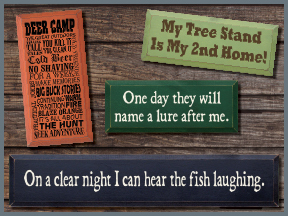 Our solid wood signs capture the feel naturally, with our funny hunting and fishing signs that are sure to make you laugh!With over 40 colors to choose from, your solid wood sign from Sawdust City will look great anywhere! We interrupt this marriage to bring you fishing season.